Kambiz Derambakhsh was born in 1942 in Shiraz, Iran. He studied fine arts in Tehran fine arts faculty and has been a member of the jury in the number of international cartoons and caricature competitions and exhibitions. Participated in more than 50 solo and group exhibitions in Iran and abroad. - France most prestigious Award; "the National Order of Merit"
His cartoons and caricatures are published in many well-known local and international newspapers and magazines for more than 55 years. 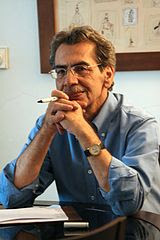 He has published many books in Iran and Internationally in Caricature, Cartoons, and Illustration. Some of the titles are "No Comments" in Iran, "Diaries of Angels" in Iran, "Kambiz's Book" in Italy, "Contemporary Satirist Book" in Iran and Italy, "Laughing Olympics", "Had Da Vinci Seen Me", "Scratch Symphony", "Don't Thumb the Hard Working Ants" and some more are in progress. Collected by various well-known museums and art centers in the world including Basel Caricature Museum in Switzerland, Gabrovo House of Cartoons in Bulgaria, Avignon Museum in Paris, Warsaw Cartoon Museum, Frankfurt Municipality, Anti-War Museum in Yugoslavia, Hiroshima Museum in Japan, Istanbul Caricature Museum in Turkey, Tehran Museum of Contemporary Art, Saba Cultural Center, Museum of Modern Art in Tehran, National Iran Library, Graphics Artists Syndicate Museum.